I am getting old. The folly of youth is sadly a distant memory. Recently, I witnessed a collection of cars assembled on a patch of tarmac, adjacent a main road. The vehicles were evidently the pride and joy of their young owners. Brightly coloured hatchbacks with flared wheel arches were the order of the day. Oversized exhausts with ubiquitous sounds of rumbling and revving, the chosen means to exhibit alpha-male status. A hierarchy was evident, based on the size of wheel rims and the wattage of sub-woofers. I noted the thump, thump, thump of a mind-numbing beat which clearly identifies me as a middle-aged, grumpy soul. However, I was surprised to learn that many of these testosterone-fuelled cars are actually faux “hot hatches”. Beneath the bulging bonnet of the Citroën Saxos, small engines stand testament to the high risk nature of insuring young drivers. Eye-wateringly expensive premiums clearly temper aspirations. Beneath the bravado, humble power plants are an economic necessity. Of course, there are cars which have high performance credentials. The spoiler adorning the tail of a supercar is necessary to anchor the car to terra firma. The abundance of power necessitates low profile tyres to provide adequate grip, allowing potential top speeds to be realised. Genuine racing machines need real engines, a fact I am reminded of as I handle a new timepiece from Maurice Lacroix. 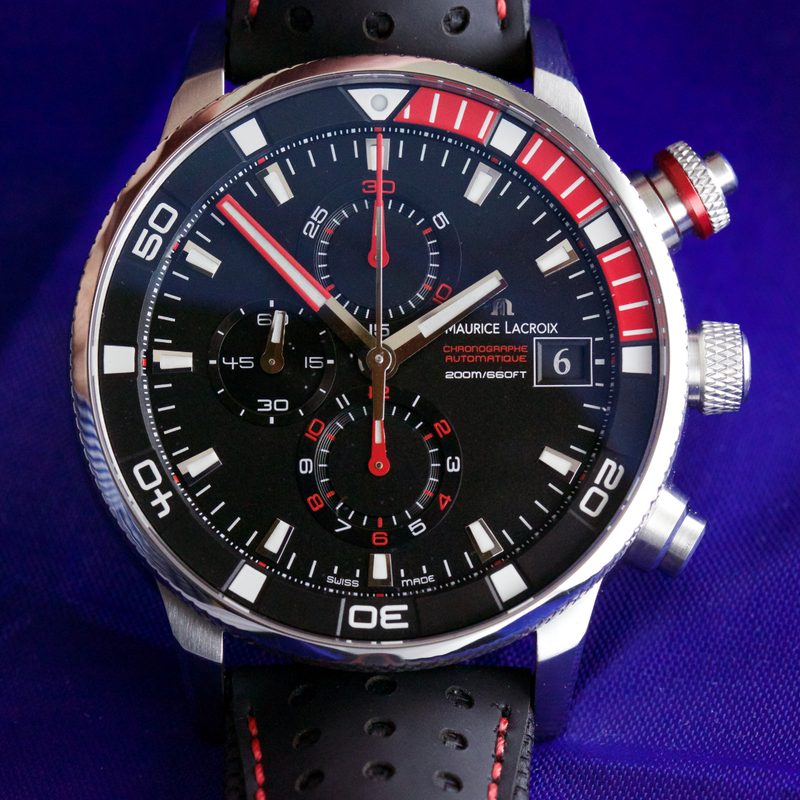 The Maurice Lacroix Pontos S Supercharged, launched a few months ago at Baselworld, is a real racing machine. Beneath its masculine torso resides a large movement, a personalised ETA Valgranges, one of the largest movements on the market measuring 37.32mm (16½ lignes). There is nothing faux about this watch, it is a genuine red-blooded racing machine. 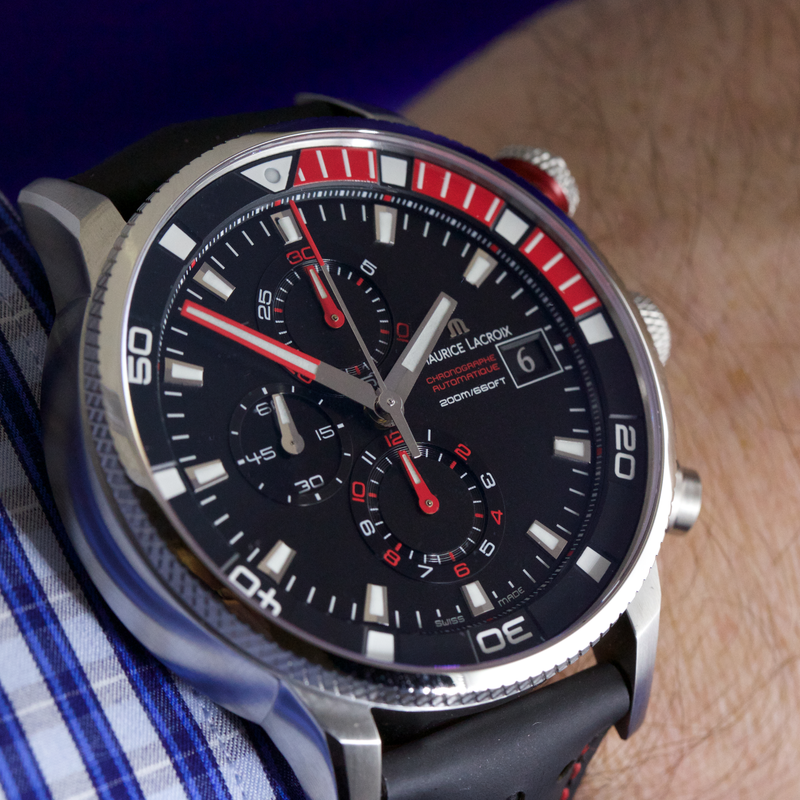 Maurice Lacroix offers the Pontos S Supercharged in two versions. An avant-garde model, with stainless steel anthracite PVD case and yellow/white dial detail, exudes sensuality. Alternatively, would-be buyers can choose a brushed and polished stainless steel case, featuring red and white hues on the dial. This particular option exhibits an ebullience and vibrancy which I find especially becoming. Indeed, it is for this reason I have selected it for this review. The hour and minutes hands are diamond cut, lined with luminous material and include steel and red tips, respectively. Indeed, these hues are repeatedly employed, extending to their use on the inner rotating bezel. The dial consists of a tri-compax layout. A 12 hour-chronograph counter resides above 6 o’clock, with Arabic numerals marking the hours. Interestingly, the even numbers are depicted in red and the odd numbers presented in naked metal. Sharing the same scale and design language, a 30-minute chronograph counter is positioned below noon. The red hand, lined with white Superluminova, matches the item on the aforementioned 12 hour-chronograph counter. A small seconds display is positioned at 9 o’clock. This subdial is smaller in size and the Arabic numerals are presented solely in white. The date is located at 3 o’clock, with white numerals proving very legible against the black disc background. Interestingly, the font employed is traditional in character, contrasting with the otherwise neoteric style of the watch. However, all elements blend harmoniously and there is no trace of visual dissonance to be found. Maurice Lacroix has expended much energy imparting subtle enhancements to this design that confer a sumptuous feel, perfectly illustrated by the diamond cut indexes. Each register features a neat snailed circlet. The luminous treatment on the hands and batons exhibits a beguiling blue emission in restricted light. This is no super-mini or hot hatch. Think of the Maurice Lacroix Pontos S Supercharged as a high-performance car with a long bonnet, requiring a large parking space. This watch has a case diameter of 48mm. It is big and flies in the face of the recent trend towards smaller dimensions. Nevertheless, I love it. This watch is bold and beautiful and I adored the way it sat on my wrist, loud and proud. Quite simply, this is not a watch for shy types. The bezel is static, despite its knurled form suggesting otherwise. I repeatedly fondled its chequered form and revered its tactile charm. Moreover, the crown shares the same aforementioned dial but, in this instance, it aids adjustment. At 2 o’clock, the patented “Elapsed Time Controller”, an inner rotational bezel, can be adjusted with a twist of a further knurled surface. At the centre of this device a chronograph push piece starts/stops the chronograph, while a relatively conventional pusher, at 4 o’clock, resets the chronograph. Maurice Lacroix has expertly blended brushed and polished surfaces, judging the resultant appearance to perfection. The caseback is solid, adorned with a matrix-style motif and text. I would have preferred to have seen an exhibition caseback on this model, however, I accept that this is more about personal preference than any fundamental failure of the watch design. Seldom do straps merit mention, but, rarely do straps offer so much visual appeal. The laser-decorated calf leather strap has a design reminiscent of a classic pair of driving gloves. 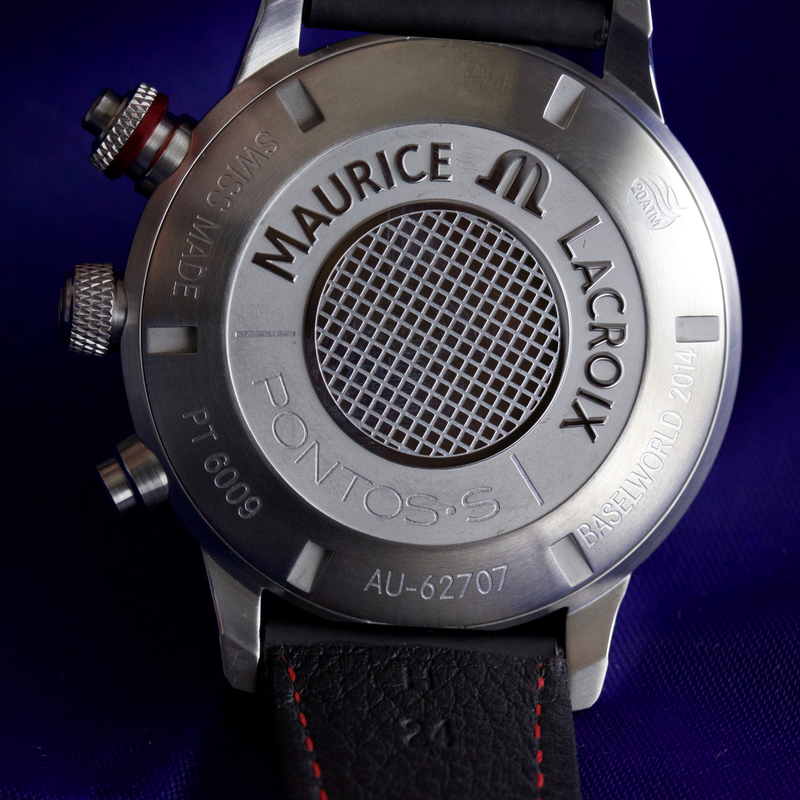 But, this is Maurice Lacroix, a brand known for pushing boundaries with thought-provoking design. The leather is partnered with rubberised details and co-ordinating red stitching. The outcome is visually very exciting and the epitome of modernity. The personalised ETA Valgranges has a frequency of 28,800 vph (4Hz), contains 25 jewels and has a power reserve of 46 hours. 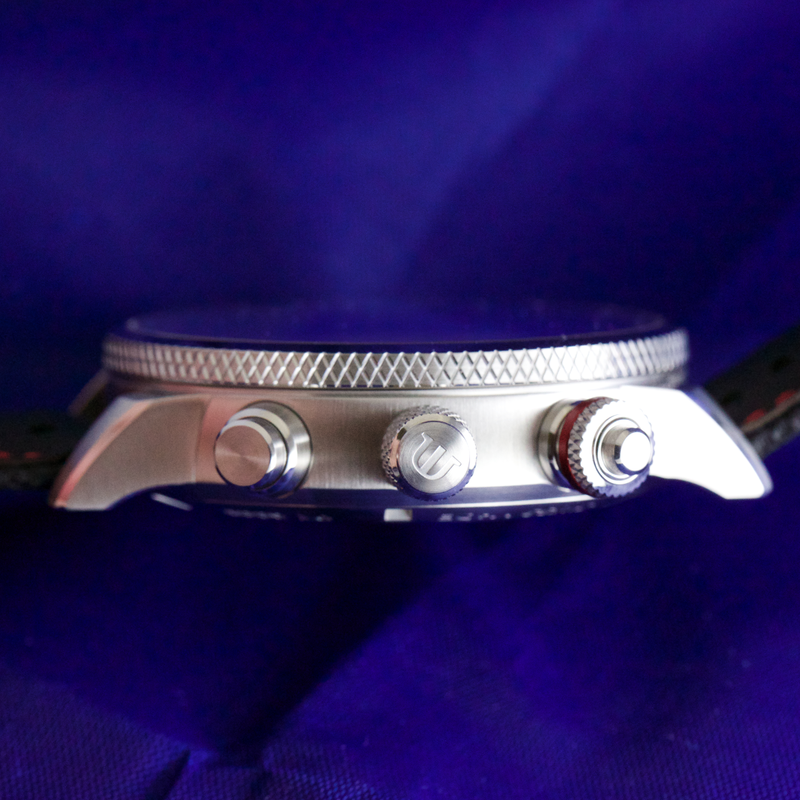 The benefit of using a large movement is it ensures the subdials are sufficiently spaced apart. Each constituent part of the dial has adequate room to breathe and nothing appears squashed. The result is a dial which is uncluttered and, by default, simple to read. Despite being hidden from view, the rhodium plated movement of this watch is decorated with perlage and Côtes de Genève motif. The brightly coloured dial and strap ensemble are extrovert in character. This is heightened further by the sheer scale of the Maurice Lacroix Pontos S Supercharged. I accept that some individuals may find this timepiece too big, but for those who have the prerequisite physique to wear this watch, you can look forward to a testosterone-fuelled visual treat. It feels extra special when placed on the arm, despite the accessible pricing. Value for money does not mean Maurice Lacroix has eschewed a meaningful engine. The movement fills the engine bay and its size means a sublime dial layout with good proportions, evident within the first moments of association. Some would-be watch buyers may not feel they can afford a proper watch and select a timepiece which boasts performance but has an undernourished engine within. 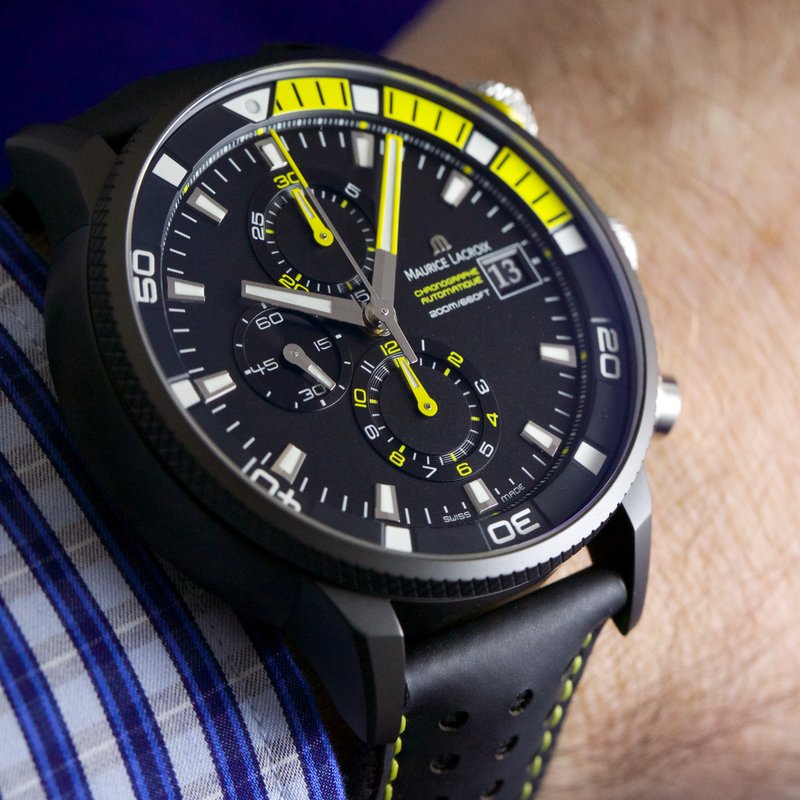 Not so with the Pontos S Supercharged, this watch has a movement that lives up to the proclamation of performance with a meaningful power plant. There is no bravado, this is a racing thoroughbred delivered in a tempting red hue that make heads yearn to turn. Didn’t you know it is rude to stare! Case: Stainless steel; diameter 48 mm; water resistant to 20 bar (200 metres); sapphire crystal to front and solid caseback. Functions: Hours; minutes; small seconds; date, chronograph; inner rotational bezel.